Posted on Sat, Jul 13, 2013 : 5:58 a.m.
826michigan will offer drop in tutoring at Beezy's Cafe this September. Nonprofit organization 826michigan, located behind the red velvet curtain in the back of Liberty Street's Robot Supply & Repair, will soon be operating out of a second location come September. The organization's says its main focus in establishing another space is to reach out to students in Ypsilanti. The organization offers free tutoring and creative writing programs from its Ann Arbor location as well as on-site visits to schools, libraries and community centers across Southeast Michigan. The new location will offer tutoring services at Beezy’s Cafe, 20 N. Washington St., in Ypsilanti, beginning in the fall. 826michigan has been offering services to Ypsilanti Middle School students out of the actual school for five years, but because the building is closing due to district consolidation, the organization had to find a new way to serve students in the area. Tutoring previously was only available to seventh- and eighth-grade students recommended by the middle school's administration, but once the program begins operating from Beezy’s Cafe, students from any district and between the age of 8 and 18 can participate. Uhle said she expects to serve more than 100 students throughout the school year at the new location. She said the drop-in system will result in varying participation rates, but she believes it will allow more students to benefit from the program. 826michigan hopes to offer tutoring out of a store in Detroit within the next year and a half. Students will be able to receive help with homework in all subject areas in two of the three rooms in Beezy’s Cafe after the restaurant closes at 4 p.m.
Uhle said 826 asked to operate out of Beezy’s because the organization has had a longstanding relationship with the restaurant, Uhle said. Cafe owner Bee Mayhew said her immediate reaction to the request was yes because she believes 826michigan makes a huge difference to kids and future community leaders. 826michigan will take on around 30 new volunteers to support the new tutoring program, which will function similarly to the program run out of Robot Supply & Repair in Ann Arbor. The new drop-in tutoring is a part of the another sign of the growth the organization has seen since it began in 2005, Uhle said. The organization works with about 2,500 students and is looking to expand its reach even further. According to Uhle, 826michigan is looking for a retail store in Detroit to run a drop-in tutoring program through as well. The organization is working to establish the right funding outlet and volunteer staff to begin the program within the next year and a half. 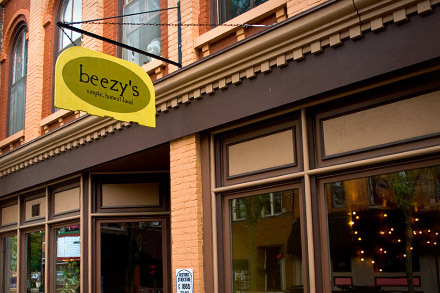 Ypsilanti area students will be able to receive help with homework from 5:30 to 7:30 p.m. Monday through Thursday at Beezy’s Cafe. 826michigan will be recruiting volunteers to help with the new program. Chelsea Hoedl is an intern reporter for AnnArbor.com. She can be reached at choedl@mlive.com. Mon, Jul 15, 2013 : 1:37 a.m. Wish a few more locations were available, a much needed and worthy cause, keep up the great work! Sun, Jul 14, 2013 : 3:17 a.m.
826 plays host at the YDL Michigan for a number of years now. This summer it is on Monday and Tuesday at I believe 5:30. Ours has been going for a long time and loves it. I am totally impressed with the whole program. Might want to check it out. Sat, Jul 13, 2013 : 8:20 p.m.
826 is a remarkable program. Readers might be interested in an article about the history. Sun, Jul 14, 2013 : 3:19 a.m.
Dave Eggers is a remarkable person. I don't know him personally but from what I have seen and heard him speak during one of the Bowls of Oatmeal program, which is awesome and comes out in October or November. I can't speak highly of this place. Sat, Jul 13, 2013 : 10:39 p.m. The history of Dave Eggers starting 826 Valencia in San Francisco and funding the program from his book sales. Sat, Jul 13, 2013 : 2:06 p.m. Kudos to two wonderful organizations on such a smart collaboration!